Between 1955-57 the excavations at Glastonbury Abbey produced the first, and to date most comprehensive, assemblage of early medieval glassworking structures and debris to have been recorded in the UK. The findings have now been published as part of a new monograph – Glastonbury Abbey: archaeological investigations 1904-79. The research, led by Prof. Kate Welham (Bournemouth University) and Dr Hugh Willmott (University of Sheffield) includes the extensive analysis and reinterpretation of over 300 individual finds and numerous archive documents. 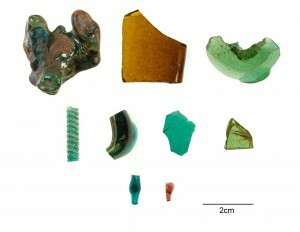 New radiocarbon dates show that glassworking activities were taking place at Glastonbury in the latter part of the 7th century AD, and that glass was being produced for use in the refounding of the monastery by King Ine of Wessex. The results highlight the strong relationship between glass and the church in the Middle Saxon period, and are a major contribution to our understanding of early production technologies.